For four years, records in the prisoners' habeas corpus lawsuits challenging the legality of their detentions have been piling up in a secure federal facility in the Crystal City neighborhood of Arlington, Va. Because much of the information is classified, the 750 or so attorneys representing the prisoners are required to do and store all their work on-site. The provision is part of a broad order (PDF) issued at the very outset of the habeas cases -- at the last official count in January, 220 cases remained -- that set rules for how sensitive documents and attorney access should be handled. It calls for the government to destroy all classified records given to, prepared by or kept by prisoners' lawyers -- including originals and copies of writings, photographs, videotapes, computer files and voice recordings -- when the cases end. Case files already fill 40 to 50 locked file cabinets, and restricted computer drives hold still more. Documents include captives' letters, drawings and poems, their attorneys' notes from meetings with them, and reports of their interrogations, according to several lawyers who routinely access the files. In some cases they describe the capture, transfer and investigation of prisoners, the identities of their accusers, and the government's reasons for holding them. The lawyers estimate that a quarter to a third of the records have been marked classified. Although the lawyers are forbidden to reveal classified details, they could include prisoners' personal accounts of abuses and interrogation procedures that have recently been described in secondhand reports. These voices have been missing, the New York Times noted today, because the government refuses to disclose prisoners' statements and their lawyers operate under a gag order. The destruction provision does not appear to threaten court papers and government records, according to a September 2007 letter (PDF) from Allen Weinstein, then the chief archivist of the United States, to concerned open-government advocates. The government is required to save those records. But letters and notes between detainees and their lawyers containing classified information will be destroyed, he wrote, because letting the government keep them would endanger the prisoners' attorney-client confidentiality, while letting detainees' lawyers keep them would risk disclosure of sensitive information. The concern that records might be destroyed seemed academic until recently. The Bush administration had for years fought the captives' right to bring habeas lawsuits, and the end of the cases seemed nowhere in sight. But last July the Supreme Court said the cases could proceed. The litigations, which had sputtered along since 2004, gained steam. More lawyers began booking hotel rooms near the Crystal City stronghold, and for the first time they're having to line up to use the 20 or so government computers there. When the Obama administration vowed to shut the Cuban prison by January 2010, the lawyers' sense of urgency increased. Attorneys think that could mean a quick end to some cases, because prisoners may waive their rights to litigate further in exchange for release or transfer. More than two dozen cases have already wrapped up at the trial-court level. Dean Boyd, a Justice Department spokesman, told ProPublica, "We are not going to destroy any documents pursuant to [the provision] at this time, nor have we destroyed any." He refused to say whether a set of the prisoners' records would be preserved or whether the administration would oppose detainees' lawyers, who say they will soon ask the court to change the order. David Remes, who represents 20 prisoners, said that "volumes of notes" taken by attorneys could be shredded if the court order is enforced. He said he and colleagues have spent 80 to 100 hours meeting with each of 18 Yemeni clients they represent, and 30 to 40 hours with two other prisoners. He estimated that 25 percent of the notes of these meetings include classified information. He and several other attorneys complained that the government is over-classifying information and that records posing no threat to national security could be erased. Classified status, which is meant to protect national security, is decided by executive-branch agencies including the military and intelligence offices. The current standards are set out in a 2003 executive order -- said by open-government advocates and the media to have significantly expanded government secrecy -- issued by former President George W. Bush and so far unaltered by President Obama. "There is no way that most of the stuff I'm reading is classified," said Marc Falkoff, an assistant professor at Northern Illinois University College of Law who began representing Guantanamo prisoners in 2004. "I would love to hand you a three-ring binder of all the documents the government has submitted as justification for keeping one of my clients in Guantanamo, and you decide for yourself whether the quality of this information is something you think justifies seven and a half years in prison." The government treats any material originating from the prisoners as "presumptively classified," said Gitanjali Gutierrez, an attorney with the Center for Constitutional Rights who represents Mohammed al-Qahtani in his habeas suit. Qahtani is the alleged 20th hijacker, whose military commission charges were dismissed after a top government official concluded he'd been tortured. The Justice Department’s Boyd confirmed that communications between prisoners and their lawyers are presumed classified, but said that the court has approved that approach and that there’s a procedure for reviewing whether something is properly classified. Even if some of the records legitimately need to be classified, Gutierrez said, they should be preserved to enable a future evaluation of this time. "Historians are going to go berserk when they find this out." 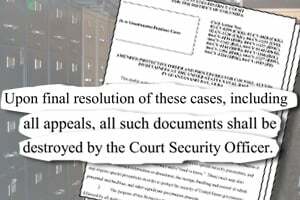 It's not unusual for classified court records to be shredded, said Meredith Fuchs, general counsel of the National Security Archive, a nongovernmental organization that collects and publishes declassified documents. But she said these cases have unusual historical importance, and she's especially concerned that the court order requires destruction of originals and all copies of certain records. When the terms of the 2004 order were first being debated, the prisoners' lawyers were struggling just to meet with their clients and learn the basic details of what they were suspected of doing. The survival of case records seemed a distant problem, said Remes, who as a partner at the law firm Covington & Burling led negotiations over litigation rules on behalf of the prisoners. "At the time, we didn't know what we didn't know" about prisoner treatment, said Remes, who left Covington in July to found a human rights firm. "Document destruction didn't really emerge as a problem until December 2007, when it emerged that [CIA] tapes of waterboarding had been destroyed."